Tales of Two Cities: A Persian Memoir is an engrossing, cross-cultural memoir of revolution and exile. It is the story of a fifteen year-old Persian boy sent for his eduction from an old-world, pre-oil boom Tehran, to the new-world, avant-garde San Francisco of the 1960s. Abbas Milani richly chronicles his education, politicization, return to Iran, disillusionment and eventual exile. Interwoven with the brisk narrative is a loving account of the traditional Iran of the author’s childhood; a searing memoir of a lost generation of Iranians torn apart by revolution and exile, a graphic portrait of the author’s time in the shah’s jail and of his cellmates, the mullahs who would soon emerge as the new leaders of the Islamic Republic. 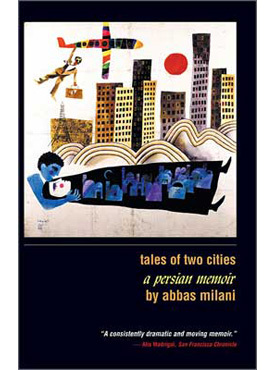 Tales of Two Cities: A Persian Memoir is not only the odyssey of one intellectual doomed to exile, but also a message of hope and ultimately salvation for the increasing number of people forced to leave their homeland and settle in America.